Drawing scale is 1.5 pixels per mm. The parts at right show a pair of stainless spring spacers that are spot welded on to a bridge piece that has two clearance holes to suit the small brass screw. The grooved lug piece has two tapped holes and two clearance holes to suit the thread of the brass screw. The way these items are assembled becomes clear in the large diagram below. The extruded strip material is detailed in the cross section in the small inset above. The brood sized frame is similar to frames that fit a Catenary hive, but it's shape is not quite the same as the only wooden samples that I have seen. These wooden Catenary frames are at BBKA headquarters. I conjecture that these aluminium frames were intended to sit in two B.S. Shallow boxes that were stacked one upon the other, with no regard for the bowed shape of the frame bottom. I think that the area of a full set of such frames would be sufficient for most native British colonies and that as the spare space was below the main nest region and at it's margins, the space would be ignored. When a full compliment of these frames is installed in a box the spacing springs are compressed until they are all exactly parallel and vertical. Both types of frame have seven 1.5 mm holes in the top bar, these are spaced at about 50 mm centres. The two frames that I have drawn, took considerable time to clean up... There were heavy deposits of wax and propolis on all parts. The lugs, screws and top bars are identical in both types. The photograph at right shows the construction. 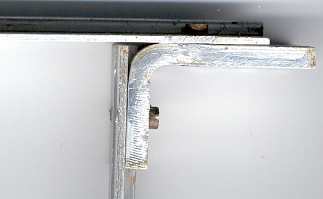 The Shallow frame has sides and bottom bar bent from one piece of aluminium extrusion. There must have been a well fitting jig used to fold the corners as no distortion of the cross section of the material occurs at the bends.